Canna Athena is a beautiful variegated mutation found off of Canna intrigue. The leaves are narrow and upright just like intrigue but parts of the plant have blotches of either green or purple. This is the same variegation seen in Canna Cleopatra. The variegation is a bit unstable like cleopatra it can revert to a totally green plant or back to intrigue if not kept in check. I keep it in check by cutting any sold color portions out. The flowers are peach orange when the purple runs up the flower or yellow. Plants are all propagated by cuttings and some may have more green or purple than others. 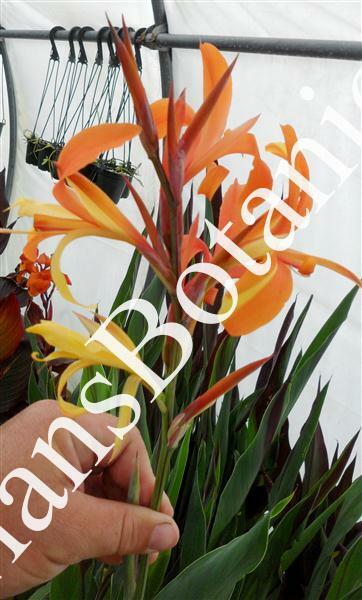 This plant should be great for collectors of variegated cannas. Sense it is new and only propagated from cutting we will have only limited stock. This plant is also non virus sense stock plant was cleaned and we have been careful to propagated it with only clean tools.